The working environments we provide are spacious, modern and friendly. We have set up our Practices specifically with our Practitioners in mind, fresh, clean and with all the equipment you need to be able to work trouble free every day. Our consult rooms are set up for both the comfort of you and the patient, should you need something extra we are happy to discuss, everything is here, you don’t even have to bring your stethoscope! 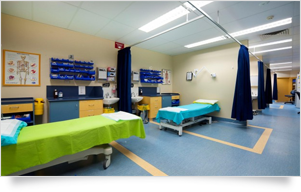 Treatment room/bays are well supplied/stocked, Nurses are knowledgeable and helpful, trained to assist and available when you need them. The equipment supplied is up to date, you may even find we have more than most and the dedicated treatment areas spacious and tidy. Being fully Accredited at all our locations means being current with industry standards, we pride ourselves on making the environment you work in to be suited specifically to the needs of our Professionals, support staff and the patient.